After listening thoroughly to “Innocence Is No Excuse” I was thinking to myself that maybe it was a brief change of pace for SAXON, a business move, which might be label oriented, that was decided to cling to and right afterwards to abandon in the next album. Nonetheless, at least to me, “Innocence Is No Excuse” was a good album, a prospect that could be built on. However, with the following release of “Rock The Nations”, traced back to 1986, I was a little baffled. SAXON were on a journey in an ongoing exploration through realms unknown, outside of their comfort zone, as if on a quest a quest to find a supplement to their image, to find their different selves. For one thing, it was hard to expect what was coming next within the varied fields of “Rock The Nations”. Unlike the steadiness that was simply illustrated in SAXON’s early discography, including the impressive predecessor “Innocence Is No Excuse”, I noticed a few experimentations, reaching out probably to gather around additional fanbases that aren’t necessarily connected to the Hard Rock or Heavy Metal spheres. Strongly implemented with aspects of Classic Rock / Rock N’ Roll / Blues / American Rock, “Rock The Nations” escalated into becoming the black sheep in the family of SAXON albums. For better and for worse. It still shared the band’s trust in the basics’ songwriting but with additional daring and looking out. At times in worked like a charm yet not always laying down the law as used to. It was highly interesting for me to investigate in depth. Of course that I found my own comfort zones in various occasions while listening, and with SAXON you can never be wrong, they are there and for the taking, nevertheless, there were patches of greatness that could be presented as unnatural. Though I am used to start with the highlights, I will surprise you and begin with my favored anathema “Northern Lady”. 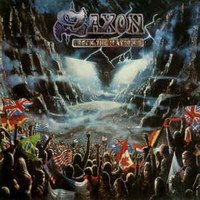 Displayed as one of the album’s leading singles, and with the respected guest performance of one sir Elton John, playing the piano, this is a different face of SAXON. A sort of balladry, acoustic meets electric AOR, hinting the 70s as well their current period, quite appealing and soft. I didn’t really expect this from SAXON even if it fitted the profile of the last song to be reserved for a sweet ballad, because it was just that. On the other hand, an old monster is hard to put to rest as “We Came Here To Rock” struck. A heavier dosage of Metal with a Hard Rock crust, a basic riff based blazer, lifting the spirit with its simplicity and memorability. SAXON seemed to have returned to the early 80s, yet with an updated sound that made wonders to their material. Salute in the name of Rock as they came to Rock. On the battle raged in the corners of “Battle Cry”. As if jumped back in time to their early heritage of British Metal, SAXON strived for a proto-Speed Metal tune, following by the book of their older personality, yet slightly far reaching thanks to the synth used. A profound anthem that is sure to be a crowd pleaser. “Empty Promises” Taking it slow with a Hard Rock fist to the face, delivering the essentials ingredients for solidity with finesse. I really enjoyed the main riff, sending a crushing blow with a soft melodic intent. After the made experiments that I listened to I was blessed with something good. I kept “Waiting For The Night” for last, as though the leading single, it didn’t really represented the album’s image. It never gets tired, well written hit, showcasing the band’s emulation of 80s AOR in their music. A prevailing melodic Hard Rock cruncher, oozed up by catchiness. Even if not part the band’s ongoing set of recent years, it is still an unquestionable marker in the SAXON career. Harbored within the special booklet for the “Rock The Nations” reissue, you will have the pleasure to find the photos of the album’s era, including the artworks of the singles. Needless to say that there are lyrics of course an a really short linear work that I believe is enough to give you an idea of what to be expect or not to expect. In addition to the booklet, there are several B-Sides included to the original album. There are the singles, “Waiting For The Night”, along with the instrumental “Chase The Fade” (Really nice show of musicianship), and “Northern Lady” that also tagged along the a duo of live tracks recorded in Madrid. Lastly, three incredible live performances at the Reading Festival of 1986, displaying a powerful “Power And The Glory” onwards with supporting the current album. “Rock The Nations” is an unexpected delivery by SAXON. It still rocks, turning its gaze to the band’s past, although with an eye to the future that could be a bit dodgy. Perhaps “Destiny” tells an entirely different story.